If it is Saturday night, that must mean chocolate cake and strange German TV programs. I may be missing the fun in a lot of this because I am not German and was only half paying attention, but this program (called “Wetten Dass?“) was truly odd. 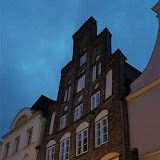 On Sunday it was raining, but still lovely in the city of Lubeck. We went for a drive to visit Olaf’s friend Christine and she took us on a little walk thru the city. As we arrived in the afternoon, it quickly got dark, which was too bad, because Lubeck is a stunningly beautiful city that was once the capital of the Hanseatic League and maintains an intense aura even today. Lubeck is known for its marzipan among other things and so of course we had to stop and buy some. In addition, we popped in briefly at what claims to be the oldest restaurant in the world. Absolutely GREAT photos. (You look much better than the cow, sweetie.) I’m getting jealous…….. I agree with Mom. You do look better than the cow. But it does appear that the cow is a better soccer player.